Well, it happened. For the first time. We (Julia and I) took our first baking order! And in the mix? Two classics. 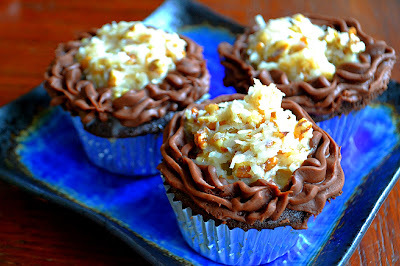 Red Velvet, which of course you loyal fans know that I adore, and German Chocolate. I have never made German Chocolate before. I have never ordered German Chocolate before. I have never thought about German Chocolate before. And folks, as The Monkees and Smashmouth once said, "then I saw her face, now I'm a believer." It was really an amazing feeling to put labor into these little guys. We bought everything, made it all from scratch and delivered it this morning. And yes, I deliver food all of the time (corporate catering, duh), but there is something about your own creation that makes it special. The effort and the time and the money seem like nothing when you love what you do and you believe in your product. Once we go global, you won't be seeing these recipes live anymore, but until then, I will let you in on our secrets. Induldge, and as the Germans say, bitte. 1. Preheat the oven to 350 degrees. Line cupcake pans paper liners (ours made 24) In the bowl of an electric mixer fitted with the paddle attachment, cream the butter, granulated sugar, and brown sugar on medium-high speed for 5 minutes, until light and fluffy. Scrape down the bowl. Lower the speed to medium, add the eggs one at a time, then add the vanilla and mix well. 2. In a separate bowl, whisk together the buttermilk, sour cream, and coffee. In a third bowl, sift together the flour, cocoa powder, baking soda, and salt. With the mixer on low, add the buttermilk and flour mixtures alternately in thirds, beginning with the buttermilk and ending with the flour. Fold the batter a few times with a rubber spatula to be sure it's mixed. 3. Scoop the batter into the cupcake liners, with a little bit of room for them to grow. Bake in the center of the oven for 20 to 25 minutes, until a toothpick comes out clean. Cool for 10 minutes, remove from the pans, and allow to cool completely before frosting. 4. Meanwhile, beat cream cheese and butter for 4 minutes. Add cocoa, powdered sugar and vanilla extract. Let beat for 3 minutes. If it is too thick, add milk. If it is too thin, add powdered sugar. 5. In a separate bowl, mix together the sweetened condensed milk, vanilla, pecans and coconut. Immediately put in fridge to help form it's shape. Pipe chocolate buttercream around the outside of the cupcake spoon topping into the center of the cake.